Proposed Domino development, view south from the water side. 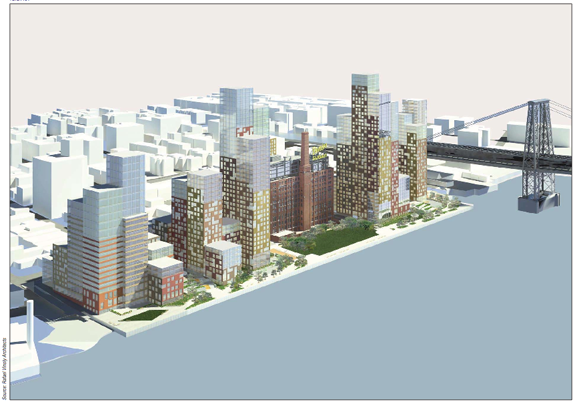 It’s been a long time coming, but the Domino Sugar Refinery rezoning is finally upon us. The Draft EIS has been completed, and City Planning is expected to certify the application today, allowing it to enter the public review. As before, the project promises a lot of affordable housing (660 units) in return for a hell of a lot of market-rate housing (2,200 units), a lot of open space (four acres), and a heap of parking (acres 1,900 spaces), scads of retail space (125,000 square feet) and even more community facility space (150,000 square feet). The project also still includes a 14-story tower on the Wythe Avenue end of the upland block and a zoning envelope that is substantially larger than anything approved during the 2005 waterfront rezoning or since. The biggest change since the preliminary presentations is that the project has now added some 50 stories (100,000 square feet, distributed among five or so towers) of commercial office space to the Grand Street end of the development. If all goes according to schedule, the public review will kick off with a presentation to Community Board #1 next week, followed by CB1’s land use committee review in early February. The full board could vote as early as 9 February, and then it is on to the Borough President. More eye candy after the jump. Proposed Domino development, view south on the upland side. The Williamsburg community does not need more and more OVER-development, it needs public services… libraries, universities, parks. Development that support a human scale, not another corporate colossus, not another development site for the developers.